7:30 a.m.: Whereas last night the only shooting we heard came from across the river, this morning we can hear shots coming from multiple directions. A friend who lives 300m away texted me a few minutes ago to say “bandits” had been crowding around outside his gate at 3 a.m., and that a house directly across the street belonging to Soumaila Cissé, one of the presidential candidates had been looted after troops had broken into it looking (unsuccessfully, it seems) for the owner. The streets in our neighborhood are calm, there are a few people going about their business but few vehicles venturing out. 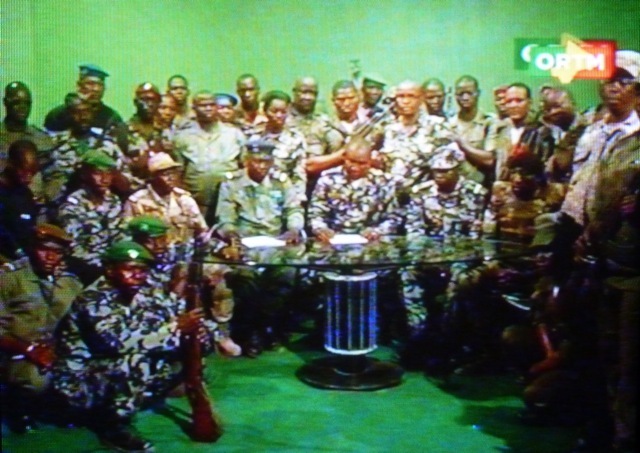 On state TV, Malian pop music videos are interspersed with a repeated short announcement by a group of soldiers calling themselves “Le Comité National pour le Redressement de la Démocratie et la Restauration de l’Etat” (National Committee for Recovering Democracy and Restoring the State or CNRDR). It shows about a dozen men in fatigues (mostly regular army, with some National Guard, plus at least one air force guy and one policeman) crowded into the studio. 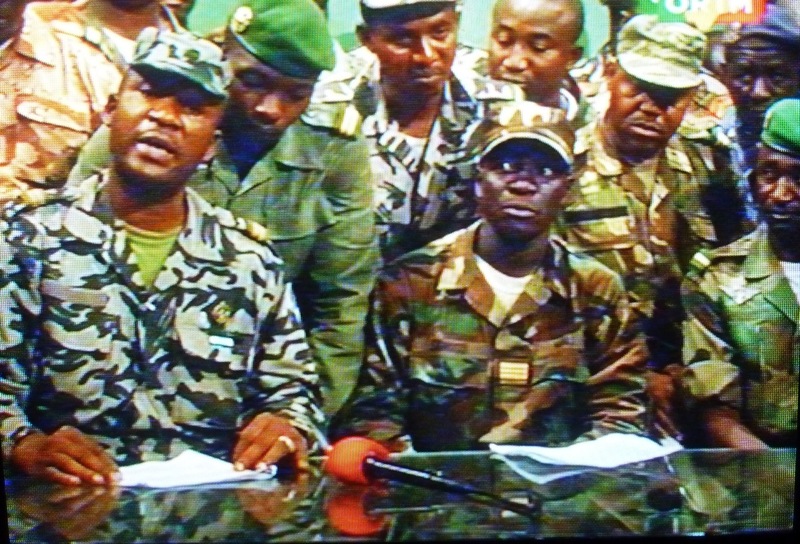 A lieutenant named Amadou Konaré reads a statement saying that the constitution has been suspended and a curfew is in effect. 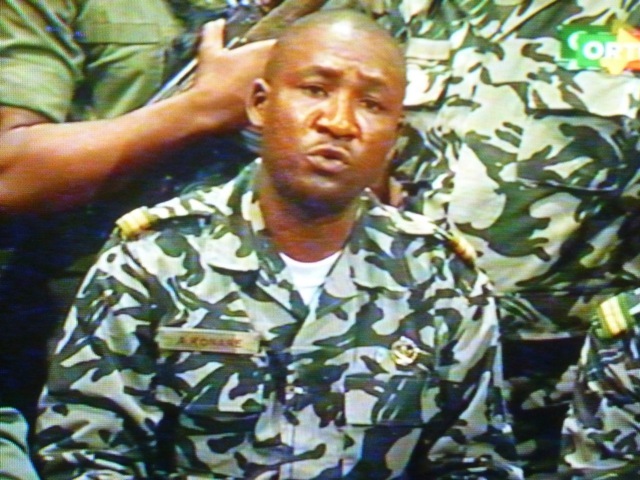 This is followed by a short statement by a gravelly-voiced captain named Sanogo, urging Malians to remain calm and reassuring them that the army will prevent looting. The CNRDR is claiming it took power because of the incompetence of President Touré, and that it will hand over power to a democratically elected regime. It’s true that President Touré has never been more unpopular in Bamako than this year, and there will be some who will celebrate his apparent ouster. (Touré’s defense minister was on BBC radio this morning saying that the president is “in a safe place” — i.e., the coup leaders haven’t caught him yet.) But it remains to be seen how this coup will be received: even if many Malians don’t like the incumbent president, they see a military putsch as a huge step backward for the country. These sorts of things aren’t supposed to happen nowadays! And of course the reaction from abroad has been uniformly against the coup. It strikes me that these coup leaders are fairly young, and many of them probably don’t remember the events of 1991 that ended years of single-party rule and brought about Mali’s transition to democracy. In other words they have grown up and come of age entirely within Mali’s democratic process — in no way are they holdovers from the bad old days. 9:00 a.m.: Someone knocks on our gate, which I’ve kept locked, and rings our doorbell. I go into the courtyard and call out “Who is it?” in Bamanan and nobody responds. Eventually we discover it’s just my brother-in-law Solo, who had his headphones on and didn’t hear me! A brief scare. Solo had ridden his motorcycle from the Badialan neighborhood, across town. He says the streets are pretty quiet, businesses and shops are all closed, and the soldiers have closed the petrol stations. The only firing now is troops firing into the air. He adds that a civilian in Bolibana, a neighborhood at the foot of the hill atop which the presidential palace is located, was killed by stray gunfire overnight. Three SMS messages from the US Embassy just received: “continue to shelter in place,” and “please prepare for possible service outages: water, electricity, internet”. Another announces that the airport has been closed. Once again I’m struck by how young these folks are. The oldest of them might be in his mid-30s. Are these truly the leaders of a coup that seems to have toppled what had been one of West Africa’s most stable regimes? Or are there more senior figures somewhere pulling the strings? It’s also noteworthy that these troops are rank-and-file, not from special units like the parachute regiment or presidential guard. I wonder how and whether they will be able to command the loyalty of their peers in other military units. 2 p.m.: An article on Bloomberg Business News, citing the French publication La Lettre du Continent, claims that overthrown President Touré “sought refuge” in the US Embassy, but a trusted source of mine in the embassy says this is untrue. 4 p.m.: A friend of mine in Missira (northeast of downtown) says he hasn’t been out of his house all day — too much shooting going on. He mentions that at least one shop in his neighborhood was looted last night. Meanwhile, the BBC says troops have looted the presidential palace at Koulouba. Here in Badalabougou, though, the shots are increasingly few and far between. Perhaps the CNRDR’s call on soldiers to stop firing into the air is having some impact. Nothing new lately from ORTM, which is still broadcasting music videos. But Africable TV has recently come back on air, playing (guess what?) music videos! 5:30 p.m.: An announcement is read in Bamanan on Radio Kayira FM — the CNRDR has sent an emissary, Adjutant Souleymane Tounkara, to this station to explain their motivation in toppling the government, and to reiterate that Bamako residents must respect the curfew. Shortly thereafter, my aikido instructor calls me to warn me to stay home and not to go downtown; he thinks I’ll surely get robbed if I venture out into the city. Asked what will become of overthrown president Touré, Sanogo replies in a roundabout way that the Malian people “know who is who, and who did what,” and that everyone must answer for what they have done. The final question concerns whether Sanogo is being manipulated by “certain members of the political class” — to this, Sanogo responds that he is so apolitical, he has never voted in his life. The Journal Télévisé starts over 30 minutes late, hosted by Aissata Ibrahim Maiga, and after the Sanogo interview it airs raw footage from Koulouba, with bullet-pocked walls and one room that appears to have been the scene of a fire. The palace looks like it is still intact, but many of the windows and fixtures have been damaged or looted. Next we see some more declarations by CNRDR spokesman Amadou Konaré, who is now referring to Capt. Sanogo as “son excellence.” Then some statements from political parties are read, expressing their support for the CNRDR and the army. Thanks for the great information, Bruce. We are all attentively following your blog! I thoroughly enjoy your writing and analysis in this post and others. I hope that you and your family are safe during this tumultuous period. Thanks for keeping us updated from a real perspective. Keep it up Bruce. I am digging your blog, n terice. Aw kolosi an’a ke dooni dooni. Amina, Sonia. Allah ka duwawu mine! Thanks for getting in touch. Thank you for your live updates! I hope you and your family stay safe. HI Bruce, We are thinking about you and your family and all Malians. Ala ka here be soro sooni. I ni Baara, Sekou! Allah k’i, an’i somogo, an’i terew beh kisi! I’m finding myself shocked to see Sidibe’s name on the arrest list (as a presidential candidate, I think, but also because of his general political clout). Any word on him or where these ministers are? woah, and Bittar – just saw that, too. Thank you so much for this great info!! Looking forward to more updates! Take care and stay safe! Thank you for the updates – it’s as much information as any news site. Prayers for your safety and that of your family from a fellow Carleton alum (’99). Thanks for the very informative news Bruce. It’s through Mary Kay that I learned about your blog. I hope all is peaceful soon. Wow, Sarah, i ni faama sa! Just this a.m. I was trying to remember your last name, which I probably forgot years ago along with most other information I’ve acquired up till then. When this coup blows over (if it blows over) I hope to catch up with you. Bruce – got to your blog via Brandon County. Much of the Malian forces have likely been trained at some point by US military during trips by training units to Bamako for just such purposes. I met a number of these trainers during trips to Bamako over the last few years but obviously couldn’t quantify the amount of training that was done. Great blog! Please keep it up and hope things improve over there sooner rather than later.